Cars are making rescue harder in the event of an auto accident. First responders now have to go outside their normal protocol to figure out how to rescue accident victims. What is different in these new cars from cars before? New types of steel make up the body of these new cars. This new type of steel is harder to cut, and contains high-voltage cables like those found in hybrid electric cars. Consumers want lighter cars with advanced power trains that get better gas mileage without having to sacrifice safety. The cars that consumers are demanding include desired safety features, but can increase injury risks for rescuers. Automakers, fire departments and educators have to work together to come up with measures to help educate and inform first responders on rescuing techniques that do not harm themselves or the accident victims. Kia Motors, based out of South Korea, recently donated 32 3-year-old Borrego SUVs equipped with recent technology, for training for at fire academy in Los Angeles. Crews will tear the cars apart while undergoing first responder training. “We need to tell them where all the hazards are,” states Kia spokesman Scott McKee. Air bags; Cutters and other extraction tools may puncture the propellant tanks of any air bag that did not deploy in the accident. Hybrid batteries; Hybrid batteries connect to high-voltage cables. It is critical for first responders to know how to handle these high-voltage cables and lithium-ion or nickel-metal-hydride-batteries after an accident. High-strength steel; the bodies of cars are manufactured with higher strength steel. High-strength steel saves on weight and boost gas mileages in cars. The new steel is much lighter than standard steel, but much tougher to shear, bend or tear apart. The steel must also meet tougher roof-crush standards making support pillars stronger and harder to snip. Keyless ignitions; Many cars are now coming with push-button ignitions. Push-button ignitions make it harder to tell when an engine is running. Even before these new upgrades were installed in cars, first responders have always had to exert extra caution when assisting in an auto accident. Conventional cars, with a full tank of gas, can explode after a crash and fire. Also, accidents can leave cars in precarious positions requires time-consuming stabilizations before rescue efforts can begin. Currently, first responders must spend valuable time examining the threats they may face. These threats depend on new engine types including diesel to plug-in electric, plug-in hybrid, hybrid, natural gas and even hydrogen-powered cars. First responder can identify what type of engine some cars have, but others are harder to identify. Firefighters know instantly that a Honda Insight is a hybrid, but Buick Enclaves and Toyota Camry’s are more elusive. Both Enclaves and Camrys come in hybrid versions and look nearly identical to conventional versions of the car. Older cars, too, can be harder to identify. The Saturn Vue and Chevrolet Silverado both contain mild hybrid systems that pack up to 50 volts instead of the standard 12-volt systems, making them harder to tell apart. First responders and emergency personnel are left to figure out how to identify cars that may pose a threat. Some have recommended the use of labels. A label would go on the outside of the vehicle on the lid of the trunk. This label would denote the type of power the engine is running on. There would also be a corresponding label inside. This program is already in place in cars that run on compressed natural gas. These cars have a blue diamond-shaped sticker on the rear that read CNG. Critics of this method say that stickers on cars can be ugly. Also, a quick-reference guide containing every hybrid or electric car or truck model and the hazards associated with each, may be the answer. Toyota says it distributes guides not just to first responders, but also to towing companies and operators. GM has taken a more hands on approach to the new car problem. They have developed a training program for first responders teaching them how to deal with electrified cars after a crash. So far, more than 10,000 people have taken the online course in electric-vehicle safety. Other issues include steel cutting and air bag safety. The high-strength steel is proving to be too much for current first responders’ tools. To overcome this issue, first responders are learning new angles of cut. Also, more cars are coming with hidden air bags. The Scion iQ boats that it is one of the smallest cars on the road but includes 12 air bags, including one at the rear hatch. First responders have to be careful not to break an air bag’s propellant tank. The best solution to the problem is just to be more careful. Firefighters are advised to use a technique called “peel and peek”, or using jaws tools to look at the hazards before cutting into the car. Also, they are now looking at the undamaged parts of the car to identify hazards. This technique works well when one side of the car is damage and the other is not. Identify hazards in this case is easier because each side of the car is a mirror image of the other. If you or a loved one was injured resulting from an auto accident, you need to contact the South Carolina Accident Lawyers at the Strom Law Firm today. We understand auto accidents can cause debilitating injuries. We will fight to get you the compensation you deserve for your injuries. 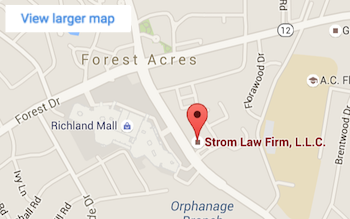 Call the Strom Law Firm today for a free consultation. 803.252.4800.